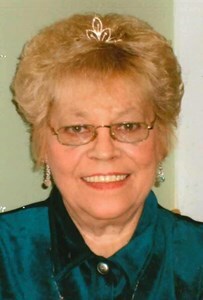 Scotia- Marilyn H. “Mare” Shuler, 75, passed away with her loving family by her side on August 4, 2018. Born on December 31, 1942 in Amsterdam, NY, she was the daughter of the late Walter and Mary (Povelaitis) Sabutis. Marilyn grew up in Amsterdam and graduated Wilbur H. Lynch High School. It was in Amsterdam that she met the love of her life Howard J. Shuler. Together they moved to Schenectady where they raised their family. She had many hobbies, including playing cards, crocheting, drinking coffee and smoking cigarettes. She adored her cats and the New York Yankees. Marilyn was a very family oriented person, she enjoyed Sunday dinners where she fed everyone and anyone. She was a devoted wife, mother, grandmother, great-grandmother, sister, aunt and friend. Marilyn is survived by her loving husband of 57 years, Howard J. Shuler; her children: Randy (Alison) Shuler, Bill Shuler, Patty (David Downs) Shuler and Kim (Alison Wacksman) Shuler; her grandchildren: Holly Ann, Jeffery, Thomas, Ryan and Christopher; her great-grandson, Carson and several nieces, nephews, cousins and friends. In addition to her parents, she was predeceased by her sister, Patricia Carmichael. Visitation will be from 4 pm to 7 pm on Wednesday, August 8 at New Comer Cremations & Funerals, 343 New Karner Road, Colonie. Burial will be private. In lieu of flowers, memorial contributions may be made in Marilyn’s name to the St. Jude Children’s Hospital, 262 Danny Thomas Pl, Memphis, TN 38105. Add your memories to the guest book of Marilyn Shuler. It got to be more fun hanging out with you than going out with Randy and Bill! My condolences to the Shuler family. You will Always be know to me as "ma". So many times throughout the years you have crossed my mind. Spending time with you and Howie in the backroom, talking, laughing (alot) and listening to your humor. But most of all your advice and openness you shared not to just me but to all of us. You will be missed greatly, love always. To all my broken heart is with you. Our condolences and prayers go out to our loving daughter in law Kim and Marilyn's husband Howard and family. May you all find healing and peace by thinking of all the great times that you spent together throughout the years with your Mom and Marilyn.